I have had a bug recently. Of the organizing kind. This is a very usual thing in my home for myself to do but lately, it’s all I want to do when I have a free moment. Which is usually at 5 am or really late at night. I have always wanted a communication center for our home and preferably in the kitchen. A place to have your calendar, photos, cork boards for coupons and such. There are so many pretty ones online. 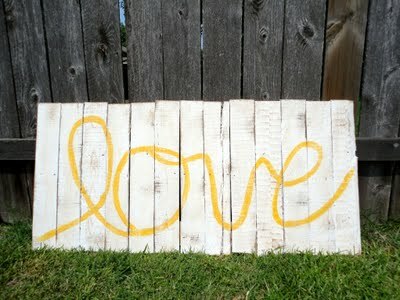 These were made from old pallets! You can find this awesome craft at Young And Crafty. I love this look but I don’t have any old pallets and I wouldn’t even begin to know where I could find one. But it did inspire me. And I thought I can do something like this too. I had this old sign I got six years ago through Terry’s Village. A little online store that sadly no longer exists. So anyway, about this sign. I liked it but it wasn’t the style I was using to decorate anymore. It was a little more country than what I am decorating now. Nothing is safe from getting spray painted in my home. The kids and maybe my husband but other than that nothing. If you came to my house and stood still long enough, you’d probably end up painted. Then I took a little of this. So I used the paint to create this kind of effect. This is on my first try if you know me you know that this must be a miracle or that some divine intervention occurred because my handwriting is bad. I left the baby monitor, fruit basket and partial trash can in the picture on purpose if I am fully trying to portray “our life”. So this is my communication center, for now. But if you know me and I think you do, this could change at any time. Nice Post, I've never used a chalk pen before! Great post. I ended up making a sign right after lol. thanks for the inspiration! AAAH! I have so much to say. lol. 1) You're crazy if you think your handwriting is bad. It is adorable! 2) I absolutely love every picture that was on this post! From the bead board organization area to your craft… LOVE! 3) Thank you for mentioning me. Do you mind if I list this post as a feature on my page? 4) I created my button through DebbieDoo's blog. I don't know the exact addy but if you google "DebbieDoo's button tutorial," it's one of the first that appears. Of course you can list this!! You have inspired many things for me with this blog including my header so please go right ahead! I will check out that blog about the button. Thanks so much for the tip! This is sooo adorable! Love all of your inspirations and that you dove right in to make your own! I have the organizing bug right now too.. I have been cleaning out the kids bedrooms and am ready for a full out overhaul!